The Broncos’ 24-10 upset win over Carolina was a trudge, but news tweeted in the fourth quarter was sad for Seahawks fans: Marshawn Lynch is retiring. But it’s good news for the Beast. Just when the Seahawks season was three weeks done, now I want them to play the Broncos next week. After watching the Denver defense discombobulate QB Cam Newton and the Carolina Panthers 24-10 in a mostly dreadful Super Bowl Sunday, I’m curious. Could the Seahawks defense have smothered up Denver QB Peyton Manning even more? Could we have had the first 3-2 outcome in the game’s 50th anniversary? The prospect of watching game MVP DE Von Miller blow past either Russell Okung or Garry Gilliam for multiple sacks of QB Russell Wilson would not have been pretty for Seahawks fans. But surely Wilson would have fared better than Newton, whose decision-making and passing accuracy regressed to the pre-2015 Newton, who this season was the near-unanimous choice as league MVP. A nearly universal symbol of sports retirement poignantly delivered the mostly expected, but nevertheless sad, news for nearly all the 12s: Lynch was no longer about that action, boss. At least, football action. On Friday, he began a new full-time gig as entrepreneur, opening his own storefront shop selling sportswear with the Beast Mode logo in downtown Oakland. Sunday, with the social media world aflame with accounts of the unofficial national holiday, Lynch dropped on Twitter word that the symbol of the Seattle franchise the past five seasons was retiring at 29. We’ll probably have to wait until his next appearance on Conan O’Brien’s late-night show to learn anything from him directly about his reasons. We all understand the obvious: He had the first surgery of his career Nov. 25, repairing a hernia, and inevitably experienced vulnerability, perhaps for the first time in his college and pro career. For a player who plays with such reckless ferocity, the feeling must have been disturbing. Then there is this claim, according to NFL.com’s Ian Rapoport and offered to Sports Radio 950 KJR Friday: Lynch saved all of his NFL salary, $49.7 million over nine seasons. Apparently, he lives on his endorsement money, from Skittles, Pepsi, Activision, Progressive and others — plus locally, Beacon Plumbing. As you must know, he unclogged a lot of those drains. If true, Lynch’s financial wisdom might have made a mark more impressive than making the earth move on his immortal Beast Quake run in 2010. He was smarter than probably 95 percent of his contemporaries. Lucky too: Until the end, he had an injury-free career, and landed with a franchise that managed, if not quite embraced, his iconoclasm and eccentricities. Lynch fully understood that his unique form of badassery could win championships. He could not have found a more receptive coach than Pete Carroll and former Raiders coach Tom Cable. As long as he delivered the goods, Lynch knew he could operate in a separate orbit. He also understood that the Seahawks may have come up with his near equivalent in rookie Thomas Rawls. Lynch cares enough about his teammates that the prospect of a reasonable transition was cool. The idea of moving to another club might have been considered, but the chances of replicating the advantages in Seattle were small. And then there’s what happened to Kenny Stabler. Oakland’s legendary “Snake,” who won election to the Pro Football Hall of Fame Saturday, retired two years before Lynch was born. I have no idea whether their paths crossed. Stabler died in July of colon cancer. His life before its end was miserable for another reason — Stabler’s brain had CTE, a degenerative disorder created by repeated blows to the head. The past week, the New York Times published a story about Stabler’s long cognitive decline right in the face of Lynch, the NFL and the Super Bowl. No one around the sport could have missed yet another ooga horn going off on the eve of the annual national party. And few among that same constituency could have missed Commissioner Roger Goodell’s blithe, callous dismissal of concern about concussions. During his annual state of the league presser at the Super Bowl, Goodell said Friday if he had a son, he want him to play football. A master of the tone-deaf statement, Goodell retired the trophy with that one. To analogize between a sedentary life and the violence of pro football is the acme of reckless disregard for the risk to players, and at the heart of why players are increasingly distrustful of the claims and gestures the league makes about the primacy of player safety. How aware Lynch was of Goodell’s breathtaking insensitivity Friday isn’t known, but the remark was egregious only in degree, not kind. Goodell has inadvertently exposed his bleakness before. Lynch knows. He has a ring, respect, admiration and 50 large ones in the bank, and as much good health as any ninth-year running back in the NFL could hope to have. He need suffer no longer fools such as Goodell and his machine. I’m all for these guys retiring with their health as intact as possible. Able to walk well and remain lucid as young men, let alone remaining so in middle age and later years (hopefully). I’m happy for Lynch and glad it didn’t come down to his being released and playing out the string with the Raiders or someone else. It’s bittersweet, but all in all a good ending to a memorable run. Now here’s the odd thing. His unique announcement strikes me and probably most of Seattle as cool, or at least to be appreciated as uniquely Marshawn. Ironically, Griffey also left us in an impersonal and distant manner, but one that had the opposite effect on myself and perhaps much of Seattle maybe as well. It looked bad for the organization and left us feeling cold an abandoned. In any event, I hope Marshawn ends up in the HOF too with his number retired by the organization as well. Maybe the city should just retire #24 all together. Good points, Jamo. If a player can afford to do it and has the will, sports fans always recall Koufax, Brown and Sanders at the their peaks because that’s all there was. bernie sanders? hasn’t peaked yet. Peace, and THANKS to The Beast! Time to archive and relive all of that ‘video’ action, Boss. There clearly is so much more to Marshawn than what the public sees – he’s a squared away dude, full of class, consideration and intelligence. I predict he will do quite well and impress in the private sector. Just think – no more NFL pressure to speak – it’s all on his own terms now. It’s all about that action, where “that” action will now be in the market place and through his philanthropic channels. Art – I couldn’t agree more with your statements on Lynch, his injury, his time with the Seahawks, and that the Seahawks would have done way more damage to Denver than Carolina….plus Newton is no Russell Wilson! We were truly blessed to have The Beast. I can’t wait his ring of honor induction. You’re welcome, D.J, I think Lynch spends a lot of time speaking, but only to national media with the biggest megaphones. Or Twitter. Lynch sees the world in ways others do not. In that way, he is akin to Aristotle, Shakespeare, Carlin and Jobs. All original thinkers often scorned by many contemporaries. Heavy stuff, Art. Marshawn is a heckuva RB and he grew with the Seahawks into the best he could ever be – in large part because he was allowed to be “himself.” I have great admiration for some of the things he did, but I’m not one to say he was the “heart and soul” of the team. That’s too much. The Hawks won with him and without him, just like they have with and without Jimmy Graham, just like they will with Rawls. There are guys on the team I think deserve at least as much credit as Lynch for the Hawks success and mindset, and they’re still here. The heart and soul is still here . . . I think most people admire his ferocious play, particularly the less heralded feat of turning a two-yard loss into a three-yard gain. There’s no stat for that, but there is a uniqueness that was compelling and defined a champion. That’s heart and soul. Geniuses are fun. How would you like to be the fifth guy at that dinner table? It’s all about that brand building, boss. Great player, great heart. Enjoyed watching him. Couldn’t you wait till the day after the Super Bowl for an announcement though? Marshawn was probably among those who simply ‘knew’ the Panthers would trash the Broncos. And maybe was upset the way things were going. You are not bigger than the game, pal. It’s amazing what we think we know but don’t really know. Credit to the Broncos for winning the big game. They deserved it. They beat the team that beat the Seahawks. Next year there will be a new Super Bowl champ though. It’s just too difficult to repeat. I don’t see it as being bigger than the game. Many others are grabbing on to the attention devoted to the game, including advertisers at $5M for 30 seconds. Lynch did it with one tweet for free. Smart. Contrary to some views, this isn’t church. Nothing is sacred here, nearly all of it profane. Now you’re speaking some Truth…. testify, brother! The right words are always hard to find when a truly great one ends a career. Marshawn Lynch will forever be a point of comparison, and unachievable goal for running backs. He had it all. He’ll be remembered by lifelong Seahawks fans along with Walter Jones, Steve Largent, and Kenny Easley, as one of the best ever to wear the uniform. We’ll miss you, Beast Mode. 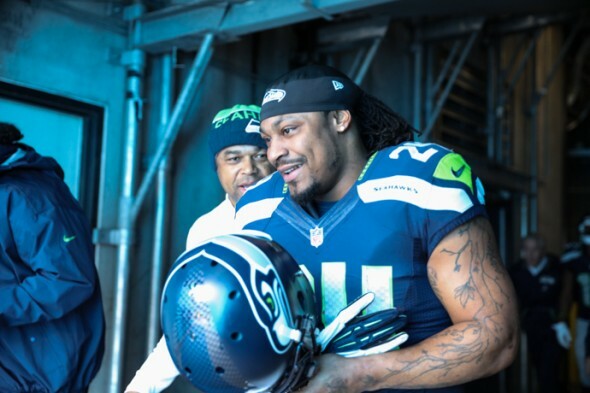 While some didn’t care for it, Lynch’s personality was a beacon in the locker room. Not everyone agreed with him, but when he spoke he had everyone’s attention. A rare figure. Yeah. Too often we define our sports guys by personalities. I’ve read that a lot of the guys from the early days (pre-JFK), would have had a helluva time fitting in to our current cookie cutter. In that way, I think Marshawn is a throwback. He seemed to believe that all anyone needed to know about him could be better shown than said. I guess the fact that I agree with him puts me at odds with some. I don’t think he deliberately colored outside the lines, though. He was just too busy to give a s*** about lines. Grainy video, stunted audio, poorly edited. Someone of his financial means–something is just off. Was it satire? Sure wish he’d spill the beans, once and for all, on that plumbing commercial. You’re right, that would be a good story. I sort of enjoyed the sloppiness. I doubt Lynch had much influence over the finished product. Not quite fifty large ones in the bank after uncle Sam takes half. But 25 large ones is plenty to be more than comfortable the rest of his life. Must be nice to live off endorsement money, but seeing how that really didn’t start to flow until he got to Seattle it sounds like it’d be kind of hard to pull off. Beacon Plumbing must have really set him up those first few years in Seattle. Sure. We know about the tax, and we don’t if the story is true, but I’ve heard from people who know Lynch that he has been smart with his money, and a shrewd negotiator when it comes to use of his name. The failed bio movie is a testament to the fact that nobody gets it right all the time. And even that shows he is no dummy. Pulled the plug well before it was ready to release…. Yes, and based on the reported reasons why he really spared us all in doing so too. That commercial truly is a Bowlclogger. The agent that allowed that pungent piece on the air needs to be dopeslapped. I’ll miss Beastmode, especially when IMO he could easily play a couple more years. Not sure if he has the numbers for the HOF but definitely will be in the Ring of Honor ASAP. We can’t know his body breakdowns. But we can trust him to know. The Beast was the face and the soul of the Hawks. I have no doubt that he is making the right decision to retire while he still has his health, both physical and mental. He has unselfishly taken a horrendous beating for his team and the 12s. It’s time for him to kick back and enjoy the fruits of his labors. His eccentricities simply add to his appeal. He can rightfully quote Frank Sinatra: “I did it my way”. I’m eager to see the non-football Lynch. Honored to watch him play the past 5 years. So many memorable moments. I sincerely hope that he ends up on the Ring of Honor, he has earned it. Yes its too bad (I guess) that Lynch is officially retiring…..but back to Sunday, looks like I was more impressed with SB 50 than others. Watching Von Miller deconstruct Cam Newton was really impressive. It was like watching the stealthy Olajowan blocking shots back in the 90’s, truly a multi-dimensional art form. Not to mention the schadenfreude of watching the humble and grounded Newton be on the receiving end! The Von Miller dude is just amazing. Anyhoo, it got me wondering: what was Pete Carroll thinking when he watched this? I would guess he is thinking the rest of the league has caught up with the Hawks….and now maybe we can use that Lynch cap room to good use? I’m sure Pete saw ways to beat both teams. He knows RW is ready to carry the offense, even with a mediocre line. But he has to find some who can occasionally get in the way of Miller and his near-equals. Good by Beastie I’ve watch in awe your five years here and never before seen the kind of running like you did. Only of days long ago did I see the kind of terrorizing like Zonka, Riggins, Campbell and Big Jim Brown. I’m very curious to see what the heir apparent will do. Ya did good Marshawn you kept your head with your money now enjoy retirement and new enterprises. This Super Bowl was a yawner all defense with only a couple sterling moments of the Master QB. Von Miller was a cheap suit on Cam and towards the middle of the 3rd Qtr, he began to look like the Cam of past seasons. We got a few weeks to go to season 2016 so now PLAY BALL y’all!! Lynch won’t have the career numbers of some, but he ranks with the best RBs to play the game. lynch probably netted around $25m after taxes. questionis whether it was worth the toll that 9 years of nfl, 3 years of pac 12, 4 years of high school, and probably another 4-5 years of youth football took on his body and brain. i’m glad art points out the brain damage issue. players younger than lynch who committed suicide recently had cte. adrian robinson was 25 and tyler sash 27. and clearly the league is still in denial as indicated by roger “couch lock” goodell. Well, that’s always the question for football, hockey and soccer players in the collision sports. Lynch was already deep into his career before the consequences of concussions became widely understood. Goodell’s remarks were beyond appalling. art, am i the only sportsnw commenter who correctly predicted (http://sportspressnw.com/2215018/2016/thiel-wont-be-43-8-but-broncos-still-doomed) that hgh manning and the broncs would win SB50? if so, what do i win? free ticket to your cocktail chat with jerry dipoto maybe? and wasn’t manning ever so petulant in his post game, kissing papa john and promoting bud to piss off goodell? think he’s a little hot about the nfl’s investigation into his ped use? since the league made chris borland give a urine sample after he had retired, i assume manning will still be subject to same if he retires. Congratulations. You show up Thursday and I’ll buy your drinks. But that means you’ll have come out behind your avatar and provide a name. Risky business for commenters, yes? An out of the box idea: Lynch at slot receiver. No, really. He has great hands, has decent speed and can you imagine him at the second level EVERY time? YIKES is what every db and safety would be thinking every time he had the ball. It would actually border on the unfair, as each reception at 5-12 yards would turn into a potential reprise of the infamous NOL Beast Mode run.